This is my third release for my Open Source class. This release is a progression on my the second release, where I used WebTorrent for sharing resource files. In the previous release, I created two different pages, one for importing files and one is exporting files. With this release, I joined the two files together, and added a few new features, such as number of peers, and download progression. For testing purposes, we have a temporary main page for testing things like the editor, the Linux terminal, or file editor. I've added the share link in there as well for easy access during testing. The look of the page is elegant now, it looks professional compared to the previous iteration. It displays the progress of the download, remaining time, download speed, download progress, upload speed, number of peers, and the total time. Once the torrent is complete, a message pop ups on the bottom saying it is complete. To start the torrent, the Start Seed button needs to be clicked first. 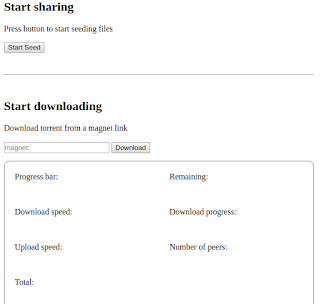 A message will display showing the magnet URI, which can then be used for downloading. For testing purposes, I'm sharing resource files between two different browsers, one on Chrome and one on Firefox. 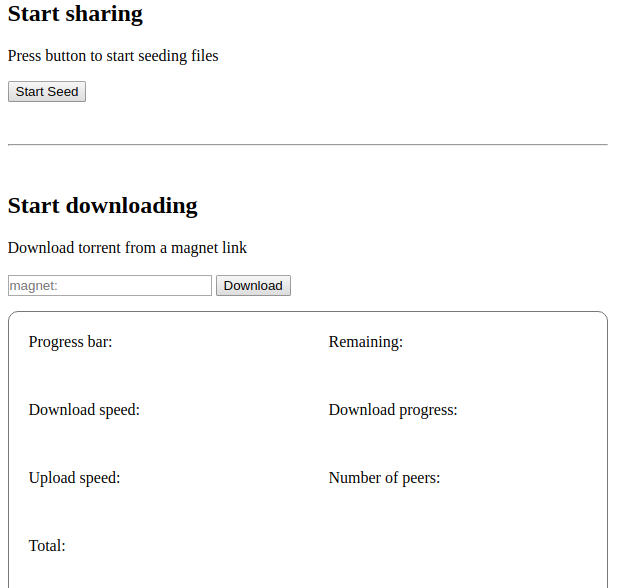 Once the magnet URI is copied into the text box and the torrent is started, the download information is displayed below.